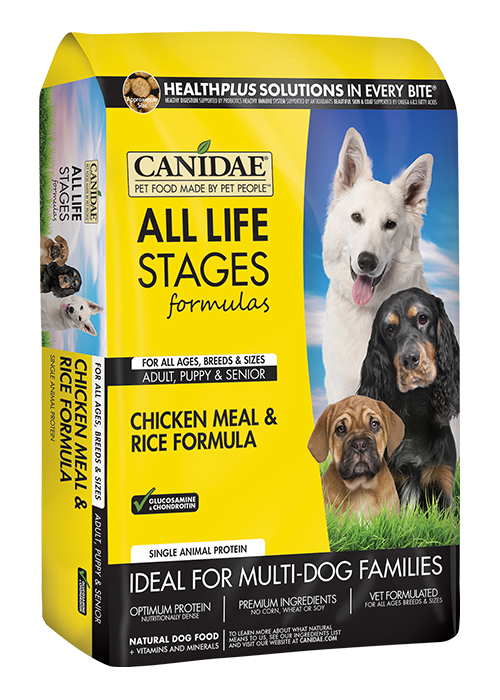 Our CANIDAE® All Life Stages Dog Dry Food Chicken Meal & Rice Formula is specifically formulated for your dog at any life stage, for any breed, or any size. This makes mealtimes with multiple pets much easier with just one bag for all dogs! Chicken meal, brown rice, white rice, rice bran, cracked pearled barley, peas, chicken fat, millet, tomato pomace, natural flavor, flaxseed, salmon oil, potassium chloride, choline chloride, suncured alfalfa, inulin (from chicory root), lecithin, sage extract, cranberries, beta-carotene, rosemary extract, sunflower oil, yucca schidigera extract, dried enterococcus faecium fermentation product, dried lactobacillus acidophilus fermentation product, dried lactobacillus casei fermentation product, dried lactobacillus plantarum fermentation product, dried trichoderma longibrachiatum fermentation extract, vitamins (vitamin E supplement, thiamine mononitrate, ascorbic acid, vitamin A supplement, biotin, niacin, calcium pantothenate, pyridoxine hydrochloride (vitamin B6), vitamin B12 supplement, riboflavin, vitamin D3 supplement, folic acid), minerals (iron proteinate, zinc proteinate, copper proteinate, ferrous sulfate, zinc sulfate, copper sulfate, potassium iodide, manganese proteinate, manganous oxide, manganese sulfate, sodium selenite), mixed tocopherols (a preservative), papaya, pineapple.